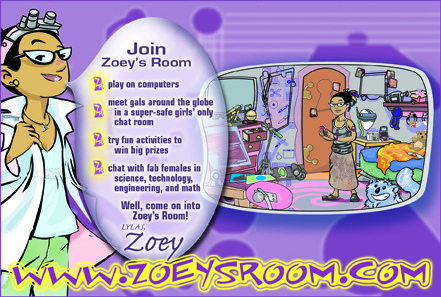 Hip cyber-hostess “Zoey” hosts her own chat room for girls every day after school. She encourages girls to explore STEM topics through fun challenges called Tec-Treks, which expand their knowledge on a range of 21st century skills, including Internet research, databases, word processing, science, business math, digital and video proficiency, robotics, engineering and website design. Formed partnerships with Girl Scouts, National Girls Collaborative, YWCA of New England, Alliance for Technology and Women and Smith College. In 2002, when past Governor of Maine, Angus King, issued Mac iBooks to every 7th grader in the state, Erin joined forces with the Maine Learning Technology Initiative to establish and deliver a comprehensive after-school program for skills development and proper educational use of the laptops.